Do you love food? Do you love FREE food? Do you like cooking or want to learn? Do you want to share your skills and earn honoraria/volunteer hours? 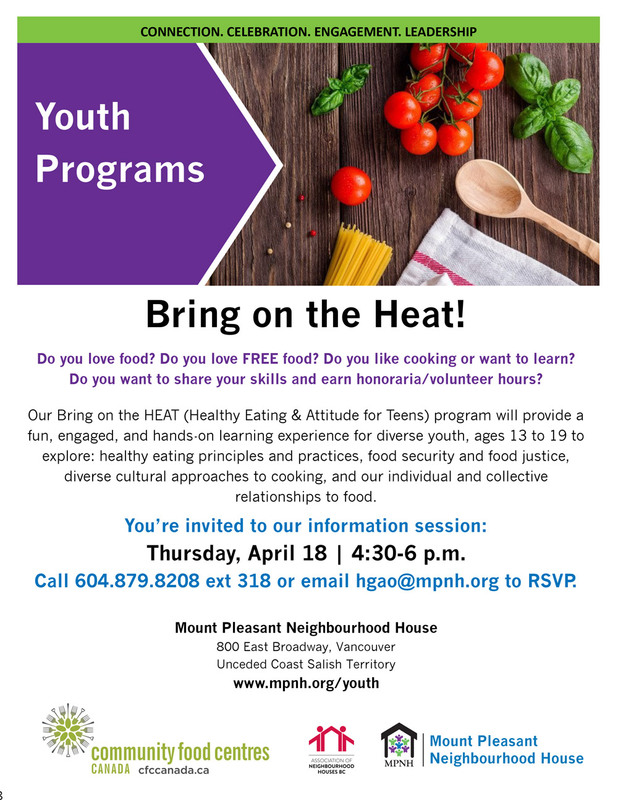 Our Bring on the HEAT (Healthy Eating & Attitude for Teens) program will provide a fun, engaged, and hands-on learning experience for diverse youth, ages 13 to 19 to explore: healthy eating principles and practices, food security and food justice, diverse cultural approaches to cooking, and our individual and collective relationships to food. You’re invited to our information session! Call 604.879.8208 ext 318 or email hgao@mpnh.org to RSVP.